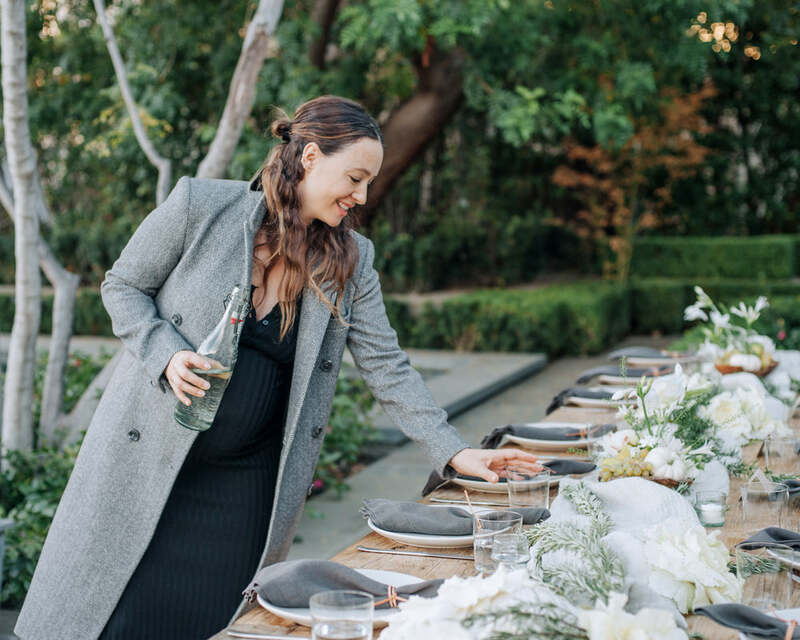 The incredibly talented Jenni Kayne has hosted a stunning FEED Supper in Los Angeles every year for the past four years – now one of our favorite FEED Supper traditions. In honor of this year's gathering, a Friendsgiving, Lauren picked her brain about hosting, her new home collection, and bringing people together around a beautiful (and impactful) table. We hope her tips and tricks will inspire you to host a FEED Supper of your own. Lauren: I loved kicking off the holiday season together this week with a festive Friendsgiving FEED Supper. What do you love most about this time of year? Jenni: There is nothing I love more than coming together with my friends and family to share a meal and get cozy, so fall is naturally my favorite time of year. It’s always nice getting back together with everyone after a long summer of kids and travel plans. We have so much to catch up on, and dinner gives us a chance to share stories. Lauren: This is your fourth year hosting a FEED Supper (and my third year joining you!). Since you are a Supper pro, can you share a few tips on how to create a meaningful gathering for good? Jenni: It is the magical combination of great food, great friends, a good playlist, and a beautiful table. Jenni: We raised 11,800 meals and counting! This is the best time of year to reflect and give thanks for everything we have and to give back to those who are less fortunate. It is an important part of every year for me and my friends and family. Lauren: When you’re thinking about setting a memorable holiday table, where do you start? What are the most important elements of a beautiful tables cape? Jenni: I typically let the seasons guide me and start with a theme that ties back to the time of year I’m hosting. I love to incorporate seasonal florals and produce. I always get very inspired by florals, so that guides the color palette I will use for the rest of the table. Soft-washed linens, ceramic plates, cups, and vases are always a staple on the table. I also love creating menus and place cards and themed take-away gifts for each guest. It’s the small touches that make all the difference! Lauren: I was eyeing a few pieces from your new home collection at our Supper. What is your favorite piece, and where can we find the collection? Jenni: My favorite pieces from the new collection are the Alpaca Colorblock Throw, Shearling Slippers, and the Cedar, Ash, and Musk candles. The collection is available in all six of our stores, online, and in our mobile Airstream, which is headed to NY next! Lauren: I’m so excited that FEED Supper is now year-round, so people can host Suppers for more occasions. If you weren’t hosting a fall gathering, when would you want to gather your friends around the dinner table to make a difference? ​Jenni: I really feel like anytime of the year is great to gather your friends around the table, especially for a good cause. I don’t think you need a holiday or excuse. Lauren: Saved the best question for last: What is your favorite holiday tradition? Jenni: Each Thanksgiving I get wishbones to set the table with and everyone can make a wish. I also love going around the table and sharing what each of us is grateful for. It’s a great lesson for the kids, and for me!